Spanwell’s industrial (large) S Hooks are easy to hang when there is a pipe or a rod readily available at your site. What do you do if you are in an all-beam environment? We help you solve that problem easily with our patented Hang-It™ Clamp. 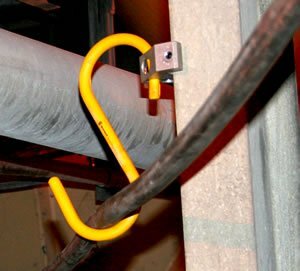 The Spanwell Hang-It Clamp is designed to hold all three sizes of our large industrial S Hooks in locations where only beams are present. Here are photos of two typical applications of S Hooks and Hang-It Clamps working together. The Clamp will fit any flange thickness that is ¾” wide or less. Our Hang-It Clamps allows the S hook to hang in many different positions. Our Clamp’s setscrew is a cup point, alloy setscrew that you should never replace with any other style setscrew, bolt or foreign object. Once you’ve installed the Clamp, be sure that the setscrew is tightened properly with an Allen wrench and that it can sustain the planned load. Additionally, it’s very important that you use the proper size Hook for the job. The lower throat opening of the 9” S Hooks is 3”, the 12” S Hook is 4” and the 14” S Hook is 5”. (See Extra Large S Hooks — Heavy Duty Hooks for an illustration). Concentrate the load in the center or “saddle” of the lower part of the S Hook. Remember that Spanwell S Hooks are not load or lifting hooks; they are organizational devices. To safely hang and load hooks, use our Hang-It™ Telescopic Rod. You can buy the Hang-it Clamp and the Hang-It™ Telescopic Rod directly from our online store. These are both made in the U.S.A. as our extra-large S Hooks and .the complete line of industrial Air (Pneumatic) Tools.